Back in November we reported that when combing through the hedge fund Q3 13Fs, Goldman Sachs cautioned that even as smart money turnover had tumbled to all time lows, net hedge fund leverage - both net and gross - had hit all time highs. David Kostin then notes that while "net leverage dropped briefly during the correction", Goldman's Prime Services attribute the decline to mark-to-market dynamics in options positions, in other words hedge funds were not actively deleveraging, something Kostin confirms, stating that "both gross and net exposures currently remain close to recent highs." ... there is some evidence that dealers have eased price terms to hedge funds and real estate investment trusts, and that hedge funds have gradually increased their use of leverage, in particular margin credit for equity trades.... such easing of price terms has taken place against the backdrop of building valuation pressures. Over the second half of 2017, valuation pressures edged up from already elevated levels. 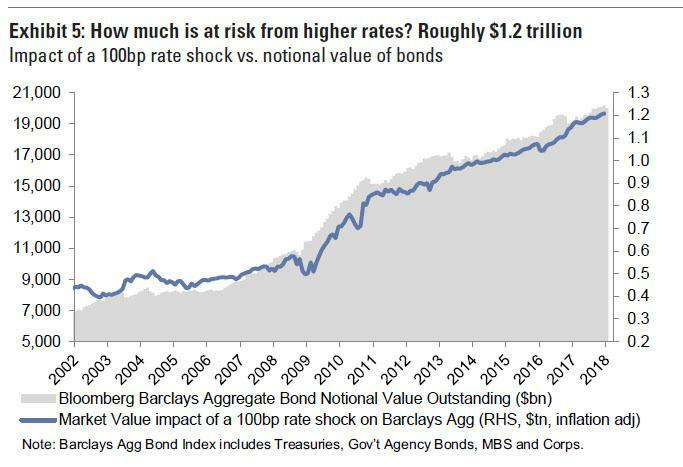 In general, valuations are higher than would be expected based solely on the current level of longer-term Treasury yields. 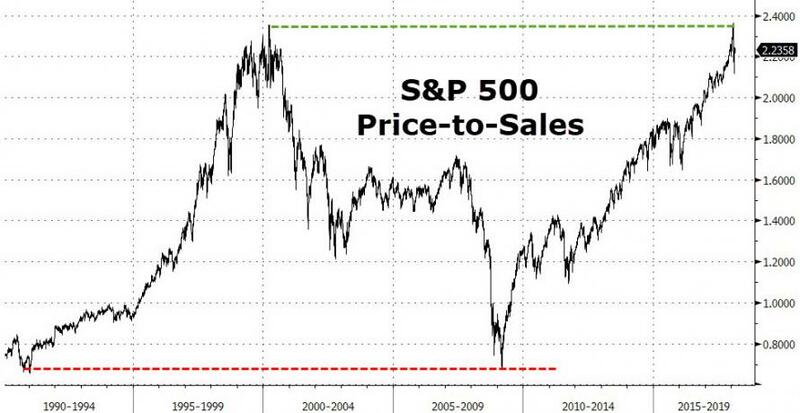 In part reflecting growing anticipation of the boost to future (after-tax) earnings from a corporate tax rate cut, price-to-earnings ratios for U.S. stocks rose through January and were close to their highest levels outside of the late 1990s; ratios dropped back somewhat in early February. 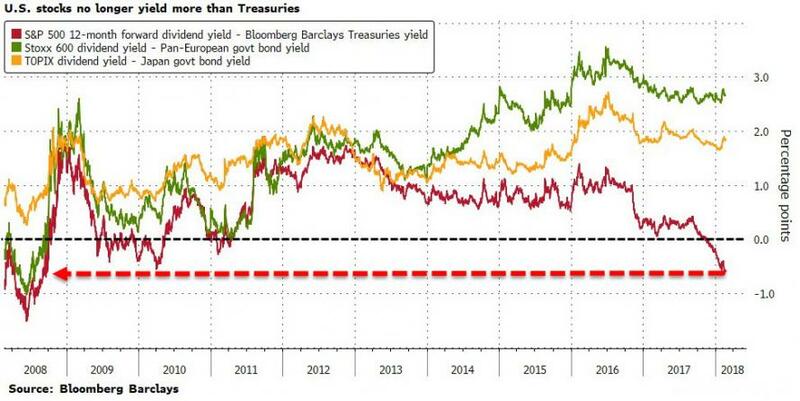 Another way of stating this: US stocks no longer yield more than treasuries. In a sign of increasing valuation pressures in commercial real estate markets, net operating income relative to property values (referred to as capitalization rates) have been declining relative to Treasury yields of comparable maturity for multifamily and industrial properties. While these spreads narrowed further from already low levels, they are wider than in 2007. In corporate credit markets, spreads of corporate bond yields over those of Treasury securities with comparable maturities fell, and the high-yield spread is now near the bottom of its historical distribution. Spreads on leveraged loans and collateralized loan obligations—which are a significant funding source for the corporate sector—stayed compressed. In addition, nonprice terms eased on these types of loans, indicating weaker investor protection than at the peak of the previous credit cycle in 2007. And in the most bizarre admission, the Fed said that risk appetite is so elevated - thanks to the Fed of course - it helped unleash the cryptocurrency bubble. If interest rates were to increase unexpectedly, banks’ strong capital position should help absorb the consequent losses on securities. About one-third of the losses that could be experienced by banks would affect held-to-maturity securities. While these losses would not reduce regulatory capital, they could still have a variety of negative consequences—for example, by worsening banks’ funding terms. The large share of deposits in bank liabilities is also likely to soften the effect of an unexpected rise in interest rates on banks. The full report can be found starting on page 24 of the Fed's report - link.